This was a multiple-microphone week, and two of my three broadcast appearances involved shows that hadn’t booked me as a guest before. That’s good. In other news: Happy Easter! A lot of material had to get left out of this already-long column denouncing the crony-capitalism campaign by Intuit and such Washington groups as Americans for Tax Reform and my former client CCIA to stop governments from letting citizens file and pay taxes at their own sites. (For example, these direct-filing sites cost little to run–$80,000 a year at California’s ReadyReturn, $150,000 for Pennsylvania’s soon-to-be-shuttered padirectfile.) Comments debuted at Yahoo Tech late Tuesday afternoon, and as you can see I did not wait long to show up in them myself. Speaking of feedback, you might as well see ATR’s latest post opposing IRS-run tax prep and stories, mine included, that suggest it would be a good thing… which, in a coincidence too weird for me not to disclose, was written by the guy who’s done my taxes since 2012. The news network’s Arabic-language channel had me on the air to talk about Google Glass and privacy issues. Since I was being translated into Arabic in real time, the producer emphasized that I speak slowly and simply–a challenge when my usual habit is to speak too fast on the air. 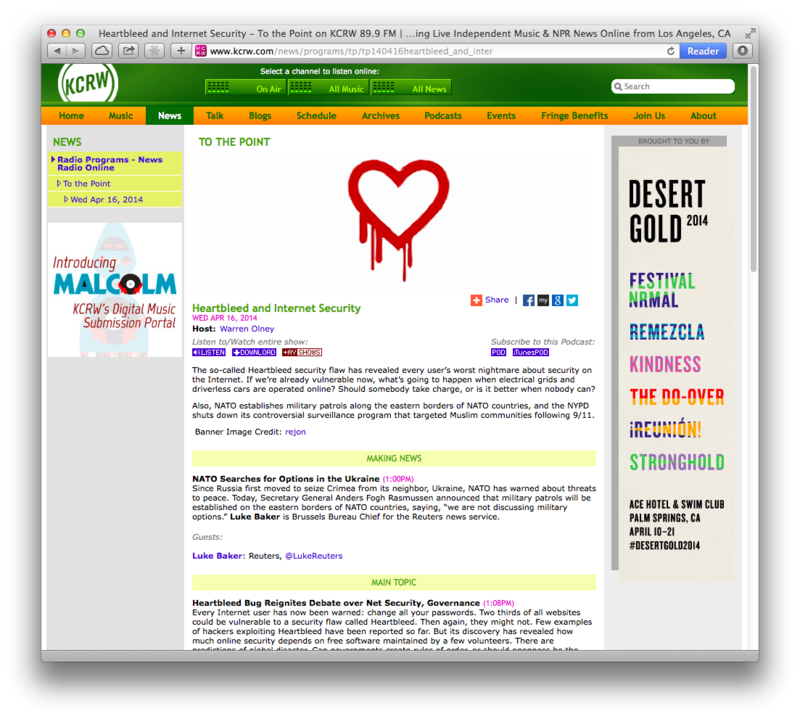 KCRW’s news show had me on to discuss the Heartbleed bug and how open-source development broke down in this case. I wish I’d thought to compare major tech companies’ unwillingness to kick in any money to the OpenSSL Foundation with all the effort they’ve put into finding ways to pipe income to shell corporations in overseas tax havens. Most of my input happened in the first 20 minutes or so, but keep listening to hear Internet Governance Project founder Milton Mueller discard some silly objections from the Information Technology and Innovation Foundation’s Daniel Castro to the government’s proposal to hand over supervision of the DNS root zone. D.C.’s news station had me on the air for a few minutes via Skype to talk about Facebook’s new location-based option, its privacy implications and how it competes with such existing apps as Foursquare and the D.C. startup SocialRadar. A relative’s question about whether he should buy a Chromebook for his online banking gave me an opportunity to note a couple of cheaper options to separate your Web financial transactions from your regular use: booting your computer off a Linux CD or flash drive, or using your bank’s app or the built-in browser on your phone or tablet. This entry was posted in Weekly output and tagged Americans for Tax Reform, android, CalFile, chrome os, chromebook, facebook, glassholes, Google Glass, Heartbleed, ICANN, iFile, Internet governance, Intuit, ios, Linux, Nearby Friends, NTIA, OpenSSL, ReadyReturn, return-free, tax prep, Warren Olney, WebFile by robpegoraro. Bookmark the permalink.